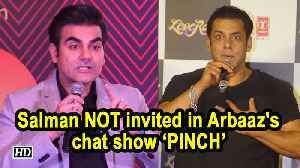 Arbaaz Khan is all set to have conversation with Katrina Kaif in the upcoming episode of his online chat show 'Pinch'. The duo were snapped arriving at the venue for the shoot on Monday in Mumbai. Actor Varun Dhawan always has broad smile on his face, whenever he comes out and pose for Paparazzi. Recently, the ‘Kalank’ actor spotted with Host Arbaaz Khan ahead of the shoot of latter’s chat..
Actor Arbaaz Khan is all set to make his debut as a web chat show host called ‘Pinch’, which will be graced by several Bollywood A-listers. But his own brother and superstar Salman Khan will not be..
Did Arjun’s GF Malaika Embarrass Sonam at a Party? With Bollywood actors Arjun Kapoor and Malaika Arora's relationship getting more visible by the day courtesy paparazzi and social media, speculation about cold vibes that Malaika reportedly shares with..